It’s always encouraging to see a performer, too young to have personally experienced the subject of her tribute show, go to great lengths to impart to her audience a real-life sense of the honoree. The flip side of that cross-generational combination is, of course, that the distance between live artist and deceased subject can be wide, despite the effort invested in the tribute (research, staging, performance style, etc.). 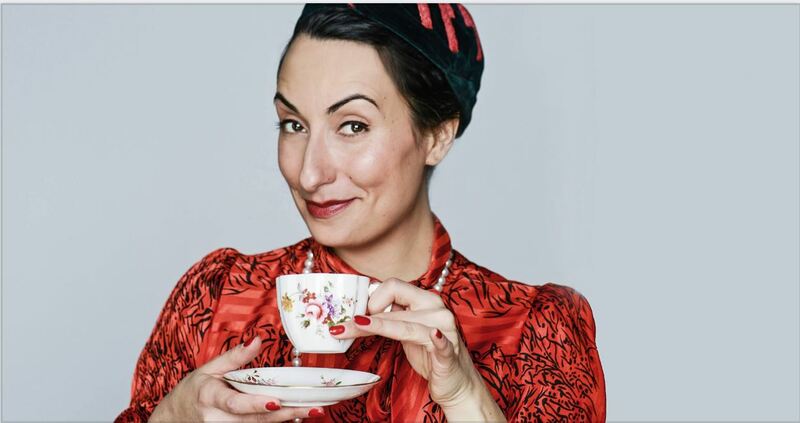 Christine Aziz’s loving but loose homage to her fellow Canadian, Tea with Bea: A Tribute to Beatrice Lillie, recently seen at the Duplex, displayed some of the pitfalls of that then-now dichotomy. All the right names were dropped in the course of this show, starting with composer-performer Ivor Novello, whose legendary parties on the French Riviera had inspired this last song. We heard a nice narrative piece on London impresario André Charlot, who discovered Lillie’s inbred comic chops soon after she landed in London in her early teens, mentored, and then fired-and-rehired her a total of six times. Another informative bit was the comparison between Bea and her American counterpart, Fannie Brice, who had a somewhat similar comic performance style and an even-more-similar tortured relationship with her producer, Florenz Ziegfeld. And we learned of her ties with Gertrude Lawrence. But, where, oh where, was any mention of, let alone a song from, the 1964 Broadway musical High Spirits (Hugh Martin, Timothy Gray)? After all, the composers’ libretto was based almost slavishly on Coward’s play Blithe Spirit, but with the medium’s role beefed up to make Lillie, as the medium Madame Arcati, the star of the show—and the show was directed by Coward, himself. High Spirits was a hit, receiving eight Tony Award nominations; it was Lillie’s farewell to live performing, and the last live performance of hers that almost any of us could have seen. One of her songs in it was “Something Is Coming to Tea,” and since Aziz’s Lillie show was a purported tea party… I’m just saying.